The cover is hideous and does no favors to the good fiction writing inside. Paco Taibo has a natural flair for conciseness and a Hunter Thompson sort of edginess to his observations. His storyline takes place along the US-Mexico borderlands and includes many geocultural details. The plot situations and characters provide local insight into one of the most troubled areas in North America. This is all packaged and put forth by an intelligent and witty author who also happens to be a popular activist, journalist, historian and colorful public figure in his own country. 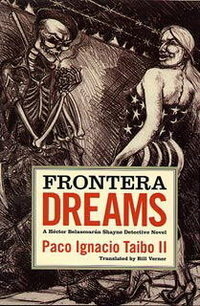 His lead character, a scarred and one-eyed detective, roams west out in Mexicali and returns east along the SW borderlands to Piedras Negras. He’s looking for an elusive person, a well-drawn femme fatale whose last name happens to be Smith-Corona, like the typewriter. The detective’s mission is mixed with his affection for her. The more urban milieu is contemporary: foul and clogged with venal druggy characters and mean Federales. The expansive countryside and desert are bleak and ancient, and allow the heart and soul to roam, as exemplified by the singing voice of Tania Libertad (the detective hears her Boleros while in a car going across country). The story is thematically framed by a Chinaman who jumps the border fence with mystical athleticism, then gets sent back. His leap is repeated like a game, a mockery of the border’s ridiculous attempts at separation. It’s a mind-expanding trip and a fast read at 120 pages. Perhaps futuristic in that sense. Posted in booknotes and tagged Paco Taibo review on July 9, 2013 by Wm P.